Starting August a little slowly, not much posts yet so far. But I'm working on it! Let's talk about skincare and specifically, serums, today. I received these adorable Olecule Skin Bionics miniatures to try out and they are specifically targeted for my skin type which is dry + sensitive. I've also problems of clogged pores and acne. It is nice of Olecule to check my blog for my skin type first before choosing suitable products for my skin. Olecule uses all-natural plant extracts at molecular level for healing and restorative purposes. MD Research is used to combine these plant-based natural ingredients combined with uniquely formulated vitamin C technology to develop these unique skincare formulations. Olecule's line of products that are made in USA help to revitalise, rejuvenate and repair the skin. These products help to protect & restore skin cell's functions, acts as an antioxidant, whitens & moisturises. Olecule has been dermatologically-tested to be safe and efficient. To be honest, I was not expecting the serum to be so tiny and be sent in a brochure-like carrier, like this. I received a few bottle of each though and the good thing about miniatures is that they are travel-friendly. Aren't they simply adorable? The full-sized products are available at 15 or 30ml each. I got the B5 Moist & Barrier Repair to help with my dry and acne skin. Each bottle comes with a tiny dropper to get to the product. I love droppers! They feel so 'scientific' and somehow look more professional :p Hygiene-wise, it also keeps germs from contaminating the formula. The B5 Moist is part of the Moisture Series and suits all skin types. With multi-molecular weight hyaluronic acid, this light moisturiser can attract up to 1000 times its weight in water to hydrate the skin. So basically, this works like a 'sponge' to provide adequate moisture to various layers of the skin and prevent transdermal water loss. Low molecular weight hyaluronic acid penetrates deep into the dermal layer to boost collagen production as well. Vitamin B5 is also added to help tissue repair and nutrients replenishment to give you significantly healthier skin. It works best with Vitamin C(e)+ and Barrier Repair. Like any serum, the B5 Moist is a watery liquid that is lightweight so that it can be easily absorbed by the skin. It is advised to use it in the morning and evening after cleansing your face. How I usually use it is just add 2 - 3 drops onto my fingers and blend it into my face. While I love how lightweight this is, it does leave a slightly sticky feeling on the skin after application. But this feeling only lasts awhile as the multi-molecular formula absorbs fast into the skin. There is a very faint fruity scent to it as well. This baby is from the Replenish & Rejuvenation Series. The main ingredient is ceramide, which is the most natural and similar element to the lipid layer of the skin. It can help to repair skin barrier and prevent trans-epidermal water loss (TEWL). Squalene is also used to restore DNA damage and strengthen the immune system of the skin. How it works is ceramide, squalene & fatty acids build up a protective layer against environmental damage and foreign substances to form a 'wall' to protect the skin. Olecule Barrier Repair suits all skin types, especially sensitive, dry and post-procedures skin as it keeps the skin hydrated all day long without excess oil secretion and does not cause breakout. Unlike the B5 Moist, the Barrier Repair leaves a matte feeling on the skin after application. It dries fast and feels smooth to the touch, no stickiness at all. The matte feeling is something interesting I've never seen in skincare products. This product is also odorless. This product goes well with Vitamin C(e) and B5 Moist. Apply a thin layer after B5 Moist in the morning and evening for optimal results. So I've been using the combination of these two Olecule products for about a month now and I'm amazed by the results! I guess it was because of stress and lack of sleep which caused my cheeks to breakout last month. FYI, I hardly ever get breakouts on my cheeks, only the forehead usually. :( It's so red and the area around the acne is dry and flaky. After using Olecule products for a month, I find that the acne and scars have significantly reduced! No more redness or angry looking pimples. Nice, right? My skin is also no longer dry and itchy, something I'm very appreciative of. - Travel-handy miniatures, I brought them with me on my travels the past few weeks and it's so convenient! 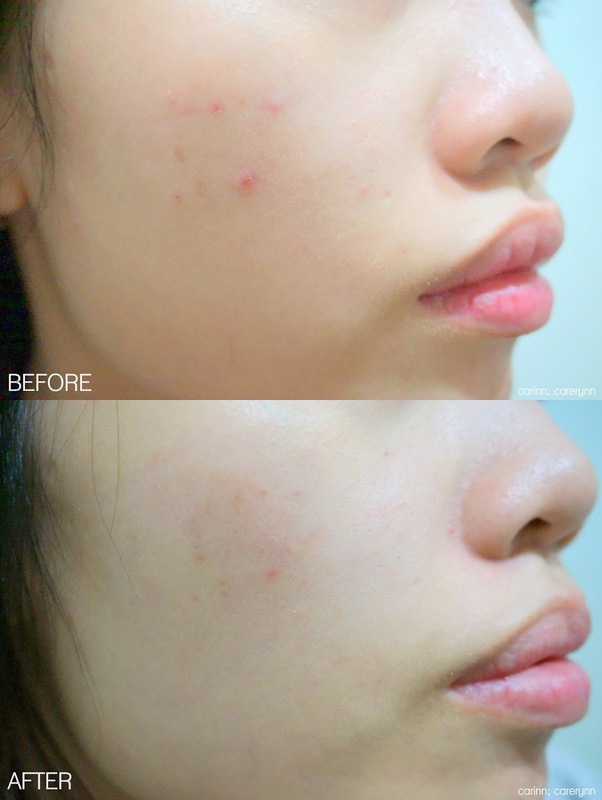 - Reduced redness & acne scars! So, if you're looking for a quick solution to matte, acne-free skin, I'd definitely recommend Olecule. I admit, I had my doubts about these little bottles at first but they sure pack a punch! One of the best serums I've used, honestly. I'm gonna be quite sad when I run out..
Disclaimer: Even though the products were sponsored, the review is based on my honest personal thoughts, experiences and preference after trying out the products. Results may vary according to individual.